As soon as I read the first line of Elizabeth Strout’s Amy and Isabelle, I knew I had been here before. But, the familiar sense was inviting so I kept reading, and the revisit was well worth it. The title characters are mother and daughter, living in a small town and each struggling – often against each other – for identity that is caught up in the balance of independence and belonging. Isabelle, the mother, is secretary to man she admires and feels caught in her status – wanting desperately to be accepted by him and not wanting to be lumped into the status of her co-workers who seem slightly more provincial than she considers herself. Amy, the daughter, has developed a relationship with a mysterious bachelor teacher, and when the relationship turns sexual and is exposed, Isabelle is not only forced to accept that she may be the topic of small-town gossip, but feels the surge of her own secret past as it catches up with her. While this is the first of Strout’s three novels, I feel like it is the best example of her art. She is excellent at creating characters who are fully human, without passing judgement on them. If you’re thinking Amy is the most obvious example of this, it is actually the portrayal of Isabelle I am most taken with. When Amy’s indiscretion comes to light, Isabelle works through a whole rainbow of emotions. Some are expected – the anger and embarrassment of the situation. But the less expected ones are perhaps those most human – the jealousy she feels at her daughter’s brush with affection and sensuality. 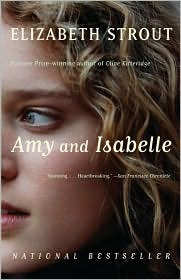 It is only as Isabelle works through these feelings that she embraces her own past and feels safe enough to share with Amy their history that ultimately leads to the sense of belonging they both are longing for. I haven't read any of Strout's novels, but as a character-oriented reader I think I'm missing out! Nymeth – You are! And, of her three, this is the one I'd recommend starting with. It will be a quick read for you – I completed a re-read in two seatings. I loved the character development in this book. My book club wasn't a big fan though. I really liked Abide with Me…I will have to pick up this one. Will have to put this one on my list. Hey, all… comments are going to my spam box, so I missed these last comments – thanks! Lola, I'm surprised… I would think this would be a great book for discussion. Bibliphile, if the book I read had been mine, I'd put it in the mail to you today, but it was borrowed. Bunny & TBM – absolutely worth it! Great review! I'm linking to it on my review of the book, which I loved.